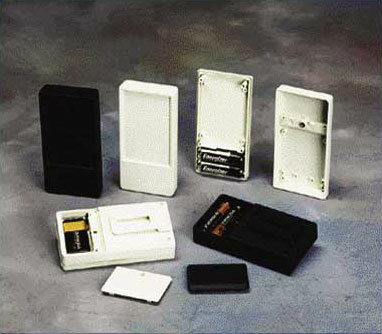 The large pocket-boxes feature a rugged design with a high sealing capacity. Contains a recessed area for membrane keyboards. Screw bosses for mounting PCBs in the top and base. Battery compartment for 2 x 1.5V AA batteries or 1 x 9V battery. Battery compartment is segmented by an internal rib. Black Infra-red versions permeable to Infra-red signals available. NEW – Height Expander Strip option increases listed heights by 0.39″. All cases available in a fine textured surface. Custom insert molding within recessed area can significantly reduce machining costs for many applications. An insert area is also available on the top end of the case. Call for minimum quantities. Pocket Box Large - Takes 2AA or 1 9V batteries , 9-volt batt. 4.27 x 2.55 x 0.86"